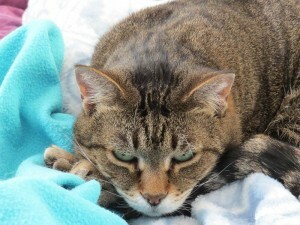 One of my six cats. This is Priscilla, 9 years old. If you’ve ever thought that cats are useless creatures, think again: even their POOP might someday bring us closer to a cure for some forms of cancer. The promising, er, ingredient in cat’s poop is actually a parasite called Toxoplasma gondii. A group of Dartmouth College researchers discovered when that this parasite gets inside a human being, it is able to kick-start that person’s immune system. So now they are working on a safe immunotherapeutic vaccine to inject into cancer patients (by the way, this is all preliminary stuff…More testing is needed before any human trials can begin…). But no, not at all. On the contrary, it makes perfect sense: by bypassing the stomach, the chewing gum system should be able to deliver more curcumin to cancer cells via the oral mucosa. The oral mucosa is basically the skin inside the mouth, which has a rich blood supply and is quite permeable. Without going into too many details (such as first-pass metabolism in the liver and pre-systemic elimination in the gastrointestinal tract…), what happens is that substances absorbed inside the mouth enter the blood system immediately, without passing through the gastrointestinal tract where absorption is slow and subject to attacks by potentially degrading enzymes. In a nutshell: the oral mucosa delivery system should be great for substances that are poorly absorbed in the gastrointestinal tract, such as curcumin. That is precisely why I used to prepare a C3 Complex curcumin powder concoction using melted dark chocolate and honey. I would keep small blobs of this concoction inside my mouth for as long as possible, under my tongue (in an attempt to maximize absorption). I still add C3 Complex curcumin to our food whenever possible, and this fall I plan to experiment with coconut oil, too. And, by the way, all my very best wishes to Dr. Nathan and her work! Hip hip hooray! 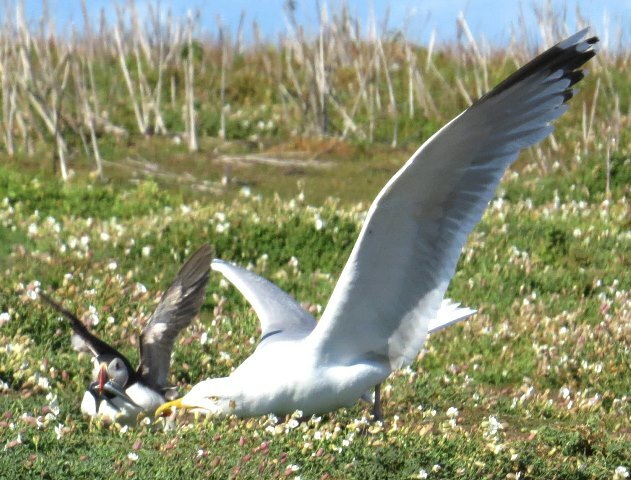 Anyone who has been around puffins (= my favorite seabirds) knows that they don’t have an easy life, especially because of their main natural predators — the lazy, greedy and opportunistic seagulls. 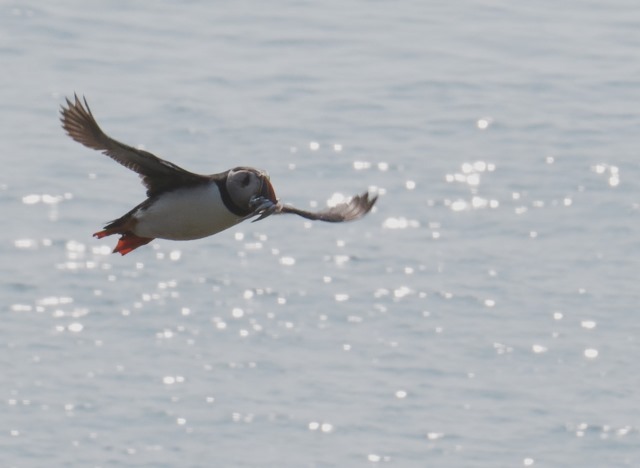 I have seen gulls pull puffins out of their burrows, trying to make them drop their hard-earned mouthful of fish. And I have seen them chase fish-bearing puffins all around the colony. 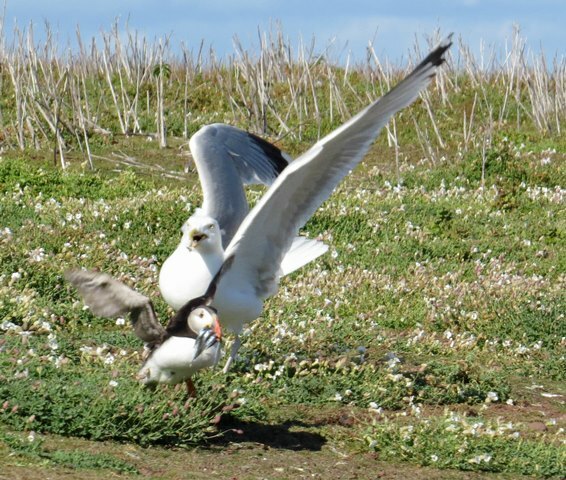 Some of these “pulls and chases” are successful, and the gulls end up swallowing their stolen goods…but others are not, thanks to the stubbornness of the puffin parents, desperate to feed their growing chicks. Anyway, I thought I’d post three photos documenting a scene I witnessed last week on Skokholm Island (where I took almost 3000 photos!). 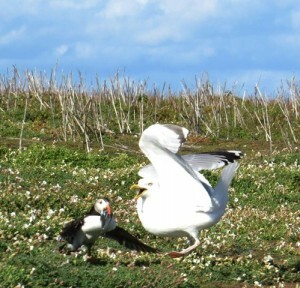 The photos show a herring gull attacking a puffin in an attempt to steal its dinner (well, probably its chick’s dinner). This is a common sight on Skokholm Island where the gulls, mainly herring gulls, hang around puffin burrows, waiting to attack the fish-bearing puffins that have just returned from the sea. Back then, in 2005 that is, I didn’t know much about myeloma, except that it was incurable. The statistics were really scary…and, almost ten years later, they are still scary. It was only years later that I realized statistics are useful ONLY in certain contexts (medical conferences, e.g. ), but to us, individuals with myeloma at any stage, they are essentially useless…We are human beings–not numbers. If circumstances change, the distribution may alter. Indeed. Stephen Jay Gould didn’t die eight months after his diagnosis, but TWENTY years later — in 2002. Based on my numbers, I should have progressed to active myeloma four years ago. This is not a wild guess on my part: in 2005 a famous Mayo Clinic myeloma specialist told me I’d have to begin conventional treatments in 2010. Based on statistics, of course. Leaving for…what do you mean? LEAVING??? AGAIN??? This time we’re flying to London, where we’re being picked up and hosted by a dear friend, Paul, whom I met thanks to the blog years ago. Paul and I began corresponding via email and ended up meeting on one of our UK trips and becoming very good friends. He and his family have been to visit us here in Florence, and Stefano and I have been to visit them in London…well, just outside London, to be precise (such a lovely neighborhood!). Anyway, we haven’t seen them for about two years now, so that is going to be wonderful. Then on Sunday Paul, Stefano and I will be driving from London to Wales where, on Monday, we’re getting on the boat for Skokholm Island. If you have no idea what I’m talking about, type the word “Skokholm” into my blog’s Search box (at the top right of this page, just above “Recent Comments”) and you will discover that Stefano and I are totally obsessed with puffins = hole-nesting auks (seabirds) with big heads and a large, bright orange beak. In fact, our bird watching hobby (by the way, my blog header right now is a photo I took a few days ago of a baby bittern at the Parco della Piana, a bird reserve just outside of Florence) began with puffins, and it was all thanks to Paul who suggested, more than six years ago, that we go to Northumberland (UK)…And that is where we saw our first puffins, on Inner Farne Island…An unforgettable experience. Anyway, Paul, Stefano and I will be staying on Skokholm Island most of next week, just as Stefano and I did last year. Shared compost toilets, no hot water, no showers, no Internet, etc. etc. etc. It sounds a bit uncomfortable but really it is one of the most amazing life experiences I’ve ever had…completely relaxing…magical. In a nutshell: I can’t wait to leave. The puffin chicks, called pufflings, have been hatching, and I hope to get a glimpse or (even better!) a photograph of one this year. I can’t change the fact that I have myeloma cells in my body. I know that I can’t run away from this cancer, and I have no intention of doing so. But myeloma won’t and can’t stop me from living. Not now, anyway…(fingers double crossed! ).